Last week Canterbury Park put away the saddles and made way for the sleds… motor sleds. 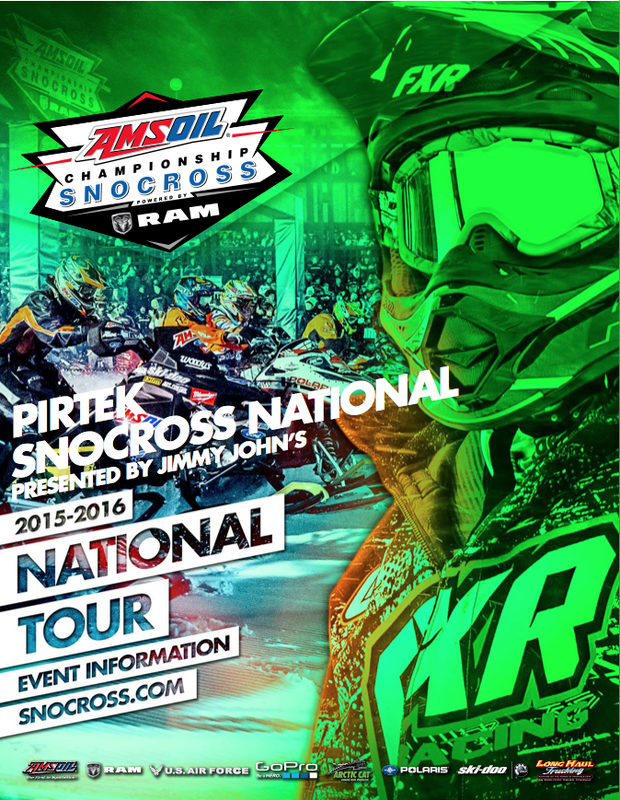 The AMSOIL Championship Snocross was in town for the Pirtek Snowcross National and IPR Digital Video and Media Production students were in the thick of it. 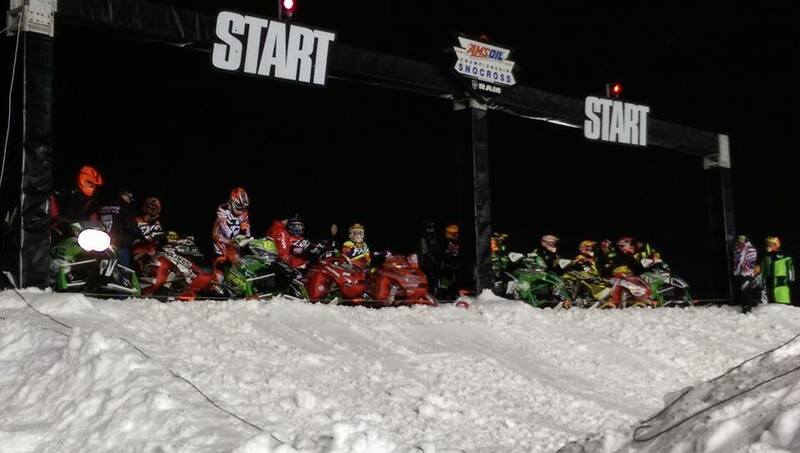 The AMSOIL Championship Snocross is an ISOC sanctioned snocross series that consists of eight national races this season. The series features the biggest names in international snocross, including AMSOIL riders Lincoln Lemieux, Tim Tremblay, and Ross Martin. Snocross riders compete on high-performance snowmobiles and race through a series of tight corners, steep jumps, and other obstacles at speeds of up to 60 miles per hour. Lindsey Lucht and Ben Thorson, both in their final term in the AAS degree program for DVMP, were guests of Instructor Andy Hunt as they got behind the scenes to see what it is like to work on the production team for an action sport like snocross. The three had pit passes and were able to tour the production van, observe the action sports media at work, and visit the press box. IPR: This was a pretty cool opportunity, what did you think when Andy told you he could get you behind the scenes? LINDSEY: I’ve been interested in Action Sports Media for a few years now, so when Andy offered me the chance to actually be a part of it, I was psyched. After getting to meet some people at Snocross and experiencing a little bit of what they do, I know that it is definitely where I want to end up. BEN: I’ve always had an interest in Action Sports media. I raced motocross as a kid and have always loved it. This experienced was amazing for me. I was able to see how a big event is run, and all the crew involved in making it happen. IPR: What was the coolest thing that you saw? BEN: The production van… It was very interesting to see the men behind the making of the broadcast. Seeing the producer calling out different cameras to put on the screen was awesome. LINDSEY: Aside from people flying through the air at high speeds, it was pretty cool being able to check out the control room and seeing all the different monitors they have to pay attention to at once. IPR: What was the most surprising thing that you saw? LINDSEY: I was surprised by how many people they are able to fit in a production truck! BEN: The amount of alumni working there. I met four people who were Globe/IPR alumni. It was reassuring that there are jobs in the field that I want. IPR: What kinds of Media Pros did you get to meet and watch while you were behind the scenes? BEN: There were so many different media professionals we were able to meet. I met one of the track camera operators, who also runs SledHead 24-7. I met the show’s producer and the crew that worked in the production van. I was able to meet the announcers at the beginning of the race. And I met the lady who was the host of the [CBS Sports Network] tv show. IPR: Did you get to meet anybody exciting form the snocross world? BEN: I was able to meet the owner of the AMSOIL race team. He was an interesting guy who is also involved in film. He told us about how he worked on Iron Will back in the day. I also got to see a few of the big name racers – even though I wasn’t able to talk to them. LINDSEY: We didn’t get to meet the racers while we were there, but I will be meeting up with Team LaVallee another time to interview them for a documentary I’m working on as part of my internship. IPR: What was the most important takeaway from the experience? BEN: The importance of hard work, dedication, passion, and networking. I was able to network and now have potential job leads. LINDSEY: … and it’s a good idea to wear boots to any event with “snow” in its title! IPR: Can you see yourself working in action sports someday? LINDSEY: Hell yeah. It’s my dream to be able to make videos for action sports. If I could do that for the rest of my life, I’ll be satisfied.